Many of my readers may not know this but the last seven years I have had the privilege to travel to some really awesome places. In 2011 I visited NYC for the first time, then a year later went to the Philippines. Getting myself out of American and as far away from home as possible not only terrified me but excited me. I decided I must see more so I traveled to Cuba, and later China. I did some crazy things like zip line through the rainforest in the Philippines where (as a grown adult) I peed my pants. In my defense, I was hundreds of feet in the air and heard a *crack* sound and thought I was about to die. I got to help women and children in rural areas of Cuba. I got to hike the Great Wall of China and eat my weight in dumplings. These are all life changing experiences but nothing compares to my favorite place so far and that is The Big Apple. That’s right. The busy, smelly and overcrowded city of Manhattan. I am still unsure as to why I love it all so much. I tell people that NYC is not a city but a world of its own. There’s nothing like it. There is an energy in the air you just can’t ignore and if you’re the right person, that energy becomes addictive. Fortunately, I was that person and I now 7 years later, I have gone on many NYC binges and can say I’m a full-fledged addict. Being an NYC addict I know a lot about the city. I’ve learned a lot about what to do and not do in the last seven years. I get a ton of direct messages on Instagram about the places people should visit, or do when they go so I thought I’d just make it easy for everyone and make a 101 Guide to visiting NYC like a local (which is really how you should visit any place you go to.) So if you’re going on a trip to the city, planning to intern there for the summer or you’re looking to possibly move, then this information will be super helpful to you. If not, then you should still read because I promise you you’re missing out. Let me know what you think in the comments below and if I miss anything feel free to share that as well. Let’s get started. Before you step foot off that plane here are some things you should know about NYC. Hopefully, these tips will help you plan an amazing trip and get the most out of the time you’re there. 1. NYC is expensive, so save money. Do your research. How long are you going to be there? How do you plan to travel around the city? Where are you staying? What do you want to do? NYC will eat every dollar you own if you’re not careful. You can do it cheaply, and I’ll tell you how, but know that this is one of the most expensive cities in America, so don’t be shocked when a bar charges you $45 just to step in the door. 2. DOWNLOAD NYC SUBWAY TRANSIT APPS. Of course, you can rely on Google Maps, but it’s not always accurate. NYC subway will be the fastest and cheapest way to move around the city but they can be delayed and change on the weekends or after 11 pm. So make sure to download an app that you trust that will update you on what trains to take and when. More on this later. 3. Look up events happening during the time of your stay. This may be because you want to have something fun to do, but even if not, it’s important to know what events are going on. NYC is a huge city filled with SO MANY DIFFERENT PEOPLE. Chances are there will be a celebrity in town, an opening to a new play, or a holiday being celebrated when you are there. This is important to YOU because this will affect hotel prices, Uber prices, subway times, traffic, and so much more. If there is a huge holiday or event going on, you need to prepare for longer commutes, constant transit changes, crowds, long waits for food, and surcharges on Ubers and Cabs. If you’re willing to wake up early, walk farther, stand longer, or run on a subway at the last minute, then this won't be an issue. Okay, I’m huge on staying in Airbnb’s or hostels because when I travel I like to be out and about all day. I’d rather save my money on where I’m staying and use it on experiences I’ll never forget. If you’re staying only for a weekend or week then this is your best bet and your wallet will thank you. Here are some hostel’s that I know are safe and affordable, but don’t just take my word for it. Do your own research. What works for me may not work for the next person. Hostels are not for everyone, so make sure to know what kind of traveler you are and what you see value in. If you sign up for Airbnb using this link (not sponsored, I just want to help you save money) then you get $40 of credit to your account. Don't let this photo fool you, I was actually lost and had to figure out my way on the subways with a dead phone, would not advise this. But it made for a great afternoon, and photo for this post. So like I mentioned before downloading NYC transit apps will be your best friend. Here are some things you should know about cabs, walking, ubers, and subways. CABS: So cabs are cool. If you’ve never been to NYC it's one of those “must do” things...you know. Hailing a cab. Make sure you hail a cab in the direction the cab is already driving. If you want to do this make sure you know these 5 things. When just the center is lit, highlighting the medallion number, the cab is available. When the medallion number, as well as the side lamps, are lit, the cab is off-duty. When no lights are lit, the cab already has a fare and it is en route to its destination. The minimum fare is $2.50. You can pay either cash or card inside the cab. When you get in, do not give the cab driver a specific address. You only give them crossing streets. For example, you won’t say “Hey! I’m heading to 123 23rd street NY, NY 12345.” You’ll say, “23rd and 4th Avenue please.” Then once you get there, stay in the cab until you’ve paid your fare, and get out of the cab through the door closest to the sidewalk. You may have to scoot a lot to get out, but everyone does it, so it’s fine. SUBWAYS: Subways will be the best option for you because it is the fastest and cheapest way to travel throughout the city. Here are apps you can download that I have used and trust. Here are tips/information you may need for traveling on the subway. Please keep in mind that if you do not follow these tips not only will you stand out like a sore thumb, but you will most likely get bumped into, or cussed at. If this happens, get out of the way and do it better next time. It’s New York. Don’t take it personally. There is no service underground so take a screenshot of the directions you need before you walk downstairs. This keeps you from reading the maps on the wall (which can be very confusing), asking a random stranger, or getting lost. READ ALL THE SIGNS. You can be getting on the 6, but make sure you know where you are (uptown or downtown) and where you are headed. If you are in Tribeca and want to go to Midtown you are going uptown, so make sure you not only get on the right train, but that it’s going in the right direction. Walk fast. Holy crap this is and should be one of the only things you do if you don’t do anything else. I promise people will purposely bump into you, knock out your coffee, and not even look back to say sorry. Keep in mind this is their commute, they do this every day. You are only inconveniencing them if you are slow. DO NOT STARE. You will see so many interesting things on the subway, but you are trapped underground in a confined space with no service. This is not the place to piss off the wrong person. Do not give any money to people who ask. Okay this sounds mean, I totally believe in giving back to people in need, but there are scammers everywhere, ESPECIALLY THE SUBWAY. They are creative and sometimes use children or disabled people to bribe you. If they put on a show, or stare you down, don’t give them money. Be kind and smile but don’t fall for anything. Take up only one seat. Make sure you don’t just sit somewhere and put your bag up on the seat next to you. Seats are coveted and some people will be on that subway for up to 20 minutes, so it’s important to not be selfish with the space you take up. Ubers/Via/Lyft/Gett: These are a couple of the car services you can order throughout the city. They are all different yet the same, but if you download at least two of these on your phone you can check prices and how they differ from another. I use Uber and Via the most, they are always affordable and trustworthy. Lyft can be sketchy in the city, but not always, and usually this is cheaper. Here are some codes you can use and get credit towards your first ride that could be saved for your trip to the airports/bus stations. Save any credit you have for rainy days, or late nights when you don’t want to get on the subway. Keep in mind, if you are near an area where an event is going on, there will be a surcharge. If you’re not in a rush or mind sharing space, you can Uber Pool and save a couple dollars. 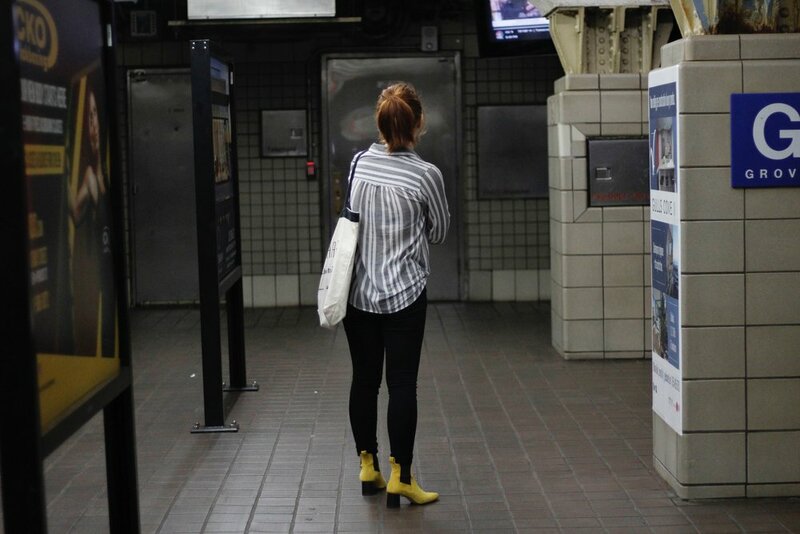 WALKING: You don’t need to be so quick to hop in a cab or on the subway. If you have the time and a good location, sometimes walking is the best way to get to know the area and see things you wouldn’t have normally seen. NYC is one of the best places to explore because you will always see something new and sometimes find places that are hidden gems. This is not only a great way to explore the city but get a good feel for the type of neighborhood you’re in. One of my favorite places to walk around in is the UES (Upper East Side) and Brooklyn Heights. Just like driving though, people walk at a fast (which is normal) pace on the right side and pass on the left. We reserve the left side of the sidewalk for people who are trying to get somewhere fast or possibly crossing the upcoming street. Do not stop in the middle of the sidewalk to take pictures or text. If you need to, step to the farthest right side of the sidewalk and get out of the way. This is a Guac Burger from By Chloe with their lemonade and Green Smoothie. I loved the Beet Ketchup the most. Roughly $20. Of course, you’re going to need to eat and there is no better place to do that than New York City. One of my favorite things about the city is that you will never crave something you can’t find. There are so many options at all price ranges. Do not fear, here are my top 4 recommendations. Keep in mind I eat cheap and don’t care for fancy places so if you are rolling in money then you may need to do some separate research for nice restaurants. Keep in mind, most “fancier” places will have a strict dress code and they are not afraid of turning you away if you show up dressed inappropriately. This place has authentic Italian food and is affordable. It’s still pretty nice at night, but make sure to show up an hour before you hope to eat dinner because it will be busy and they don’t take reservations. There are tons of locations, all of them are good. The food is fresh and honestly, I visit The Meatball Shop everytime I’m in the city. Just like the Meatball Shop, there are tons of locations of Unami Burger. It’s gourmet burgers so be prepared to eat the best burger in your life and fall into a food coma when you’re done. If you’re overwhelmed by the burger choices, “The Manly” is my favorite and will always be a good choice. Okay so they have more pizza options than just Artichoke but this place is known for that and all options are good. They also have several locations. Depending on the location you go to, depends on the seating situation. The one by Washington Square Park is standing room only, it’s also known for the place people go to when they are drunk, so if you’re looking to sit down and enjoy this pizza, check out the location in Chelsea by the Highline. This pizza is super affordable, filling and delicious. This is a vegan kitchen place but the food here is so good that anyone would love it. They have breakfast, lunch, dinner, and dessert and their smoothies are so amazing. I always get the “Guac Burger” with sweet potato fries and a lemonade. If I opted for a smoothie that day, I always go for the “Black Out.” My favorite location is the one near Washington Square Park. if it’s warm enough outside, you should take it to go, and eat it in the park with some friends. 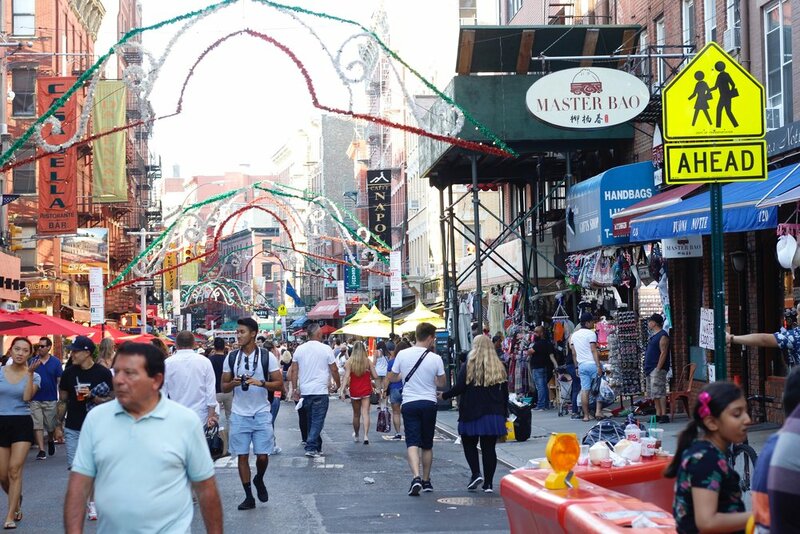 Exploring Little Italy, NOLITA area on a Saturday. So of course parks are free. Central Park could take an entire day to explore if you care to see everything. If you only care to see some parts, check out this site to see how you can explore what you wish to. http://www.centralparknyc.org/. There are so many parks to visit, one of my favorites is The High Line. Most bridges also come with parks so you can enjoy the beautiful scenery. Not only do they provide great photo op moments, but they could be great to walk across. The Brooklyn Bridge is perfect for this and takes you to Brooklyn! Viola! This ferry is not only free but provides one of the greatest views of the Manhattan Skyline, Jersey City Skyline, and The Statue of Liberty. Getting lost is free, it just costs you time and a bit more walking. If you’re up for that, you can discover new areas and even happen upon hidden gems. Shopping in SOHO, aka fashion captial of Manhattan, aka the place with the coolest side streets. 3. Visit The Empire State Building. So like I mentioned above, you can get into some of the most popular museums for free on certain days and times, or for a small donation (if you’re traveling on a budget). If you are not able to visit a museum on those days and are willing to pay the full admission price, my favorite museums are as follows: The MOMA, The MET, The American Museum of Natural History, The Brooklyn Museum, Whitney Museum of Art (has a cool rooftop), The Frick Collection, and The Solomon R. Guggenheim Art Museum. 6. Luna Park in Coney Island. A rainy night in Manhattan with nothing to do? Take photos of oncoming traffic and try not to get yelled at. There are EVEN MORE ways to save money and see it all (if you can imagine) and I’ll leave a list here of resources you should use on your trip. Know that no matter what amount of money you have or time you have to spend, you won’t see it and do it all with one trip. That’s the beauty of NYC - it calls you back for more. But, don’t worry, you’ll see enough to fall in love and start planning your next trip right away. For me, I always try new places every time I visit and it’s always a new adventure when I go. Check out these resources to find ways to save money, get free stuff, and have the best time ever. I hope this guide was helpful to you. Let me know how your city planning is going or if I missed anything valuable (probably did since NYC won’t fit into just 1 guide.) This is where we part ways and I leave you with this thought, “Just go, just do it.” Pretty simple right? Okay okay, see you in Manhattan. https://www.timeout.com/newyork Find out what specific events are happening during your stay, buy discounted tickets, get real reviews on shows and cafes, and see what the community is up to. https://www.nycgo.com/ Perfect for first timers, and people who enjoy tours. Also a great resource for discounted tickets, and line hopper tickets. https://www.yelp.com/nyc Get real reviews on just about any place in the city. https://www.nonsensenyc.com/ sign up to receive email newsletters of events (usually not more than $40) where locals hang out. This is my favorite resource and has provided so many unique and one of a kind experiences. http://www.nycandcompany.org/ Similar to NYC GO but sometimes has even more tips and hacks on getting the most out of the city. CHECK OUT MY PAST NYC PHOTO DIARIES TO SEE MY PERSONAL ADVENTURES.